I asked, "What are the differences between the approaches at Grand Valley and Stanford, and those at California and Ohio State?" (oops, I'm sorry, "THE Ohio State"). And I asked, "Which school is doing the best job?" I'll leave that question for all of you... but I will suggest that there is a vast difference between providing accessible computing in one place and providing it wherever all other students can access computing. A very big difference. 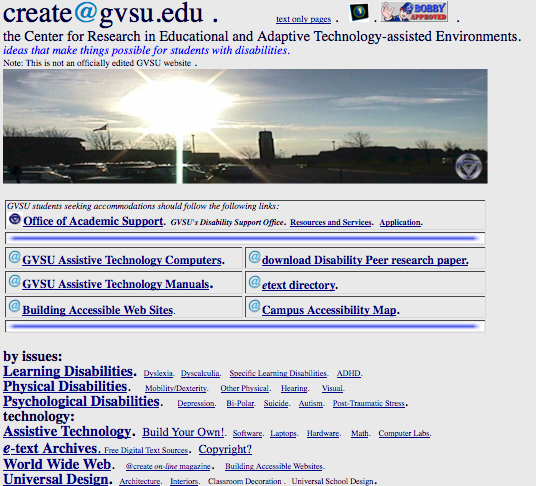 Years ago, during the last century, as I like to say, I began the implementation of the assistive technology program at Grand Valley State University. When I did that, my boss asked, "Where are we putting this stuff?" I said, "We're putting it everywhere. I'm too old to go back to a resource room." With that said, I want to suggest that EVERY computer in your school (if it is Windows) needs the following installed, and if it is a Macintosh, then, as much as you can. Because the following are all free, and thus, this is the very LEAST your school needs to do. First, Firefox. Mozilla's Firefox remains the only internet browser easily made fully accessible for free. To make it fully accessible you need to just go to the following Add-On collections which "someone" has created for you in the interest of "one stop shopping." Access Firefox Add-Ons (Windows/Linux) https://addons.mozilla.org/en-US/firefox/collections/ira-socol/mits2009/ add them all. Access Firefox Add-Ons (Mac OSX) https://addons.mozilla.org/en-US/firefox/collections/ira-socol/32ffaa9b-8a8d-20cf-f764-4ee358/ add them all. Language Pack Add-Ons for Firefox https://addons.mozilla.org/en-US/firefox/collections/ira-socol/c36d9e30-520c-cb87-9a0f-534c03/ additional language supports - this list was crafted for Michigan's student population, but may help your students as well. Then, there are additional Add-Ons for Firefox which offer other supports. CLiCk-Speak (alternative TTS) http://clickspeak.clcworld.net/ CLiCk-Speak is another choice for Windows Text-To-Speech (the collection above utilizes FoxVox). builds a DAISY book reader (from Bookshare) into your browser. Next, you need to add WordTalk to any Windows machine running Microsoft Office. Free text-to-speech plugin that works with all versions of Microsoft Word (from Word 97 and up). It speaks and highlights the text of the document when it is used. It also contains a talking dictionary to help determine which word spelling is most appropriate. New version allows text to be converted to speech and saved as an MP3 for portability. Note: In Windows Vista and Windows 7 both WordTalk and wtconfigure (WordTalkStarter) may install under “Programs(x86)” on your C-drive. Copy these two folders and paste them into the “Programs” folder. Then run WordTalkStarter. and you will want to add PowerTalk as well. Then, there is simply no excuse for not utilizing the free Ghotit app for Microsoft Word. It is free for your school network and gives both dyslexic students, and English Language Learners, fabulous spelling and grammar support. Ghotit's web app should also be a bookmark in Firefox. As should vozMe - a web-based Text-To-MP3 system. Both your Windows or Mac computers should also have desktop direct links to the "accessibility settings" - and Macs need the Text-To-Speech system turned on, while Windows machines need Speech Recognition linked on the desktop. Remember, all of this is free, and if you do this your school will finally begin to meet the federal rules about equal access to information and communication . At my university (San Jose State U) you need a special card to access the accessible computer lab. People who do not have this card, including guests of someone who does, are not allowed in the lab. In fact, the same rules apply to the accessible materials section in the library. No guests, period. So much for a study group.